NOTE: You can make this ahead of time and freeze in squares for future use. Just make sure to wrap each piece well with plastic wrap. Just re-warm in oven or toaster oven for about 5 minutes on 325 degrees. In a large bowl, mix together the corn meal, flour, baking powder, coconut sugar, salt, and spices. In another bowl, whisk together the cashew butter, applesauce, non-dairy milk, and ground flaxseeds. Fold in the corn. Mix the wet ingredients into the dry ingredients. Do NOT overmix! Pour mixture into a 9x12 glass baking dish. Bake for 45 minutes or until just firm to the touch. Serve. Soak 5 cups of soy curls in warm water for 10 minutes. Drain and squeeze out well. In 2-3 batches, place in blender and blend on the LOWEST speed for 10 seconds, just until minimally shredded. Remove to a bowl and set aside. In a large saucepan over medium-low heat, place all of the dry ingredients. Gently stir until you smell the aroma of all of the ingredients (about 2 minutes). Increase the heat to medium, and slowly add in the vegetable broth, whisking constantly. When all of the flour and veggie broth are incorporated, add in the soy sauce, mustard, and Kitchen Bouquet. Continue whisking, while raising the heat slightly. Once the sauce is at a low boil, keep the temperature stable while you whisk. The gravy should thicken in just a minute or two. Add in your drained and shredded soy curls. Serve over the warmed Savory Cornbread. Disclosure: Mrs. Plant makes use of Amazon.com affiliate links when they are available. These are products I have personally purchased and recommend based on my experience with them. Your use of these links for product purchases provides me with a commission which pays for the food and supplies I use to keep this website alive. However, your use of these links as a reader is not required. Hello Mrs. Plant thank you for this delicious alternative to traditional Thanksgiving -- is there anything I could sub for the Nooch? I cannot have it due to health issues and thanks! Cindee, I am not sure what would work in place of nutritional yeast flakes. 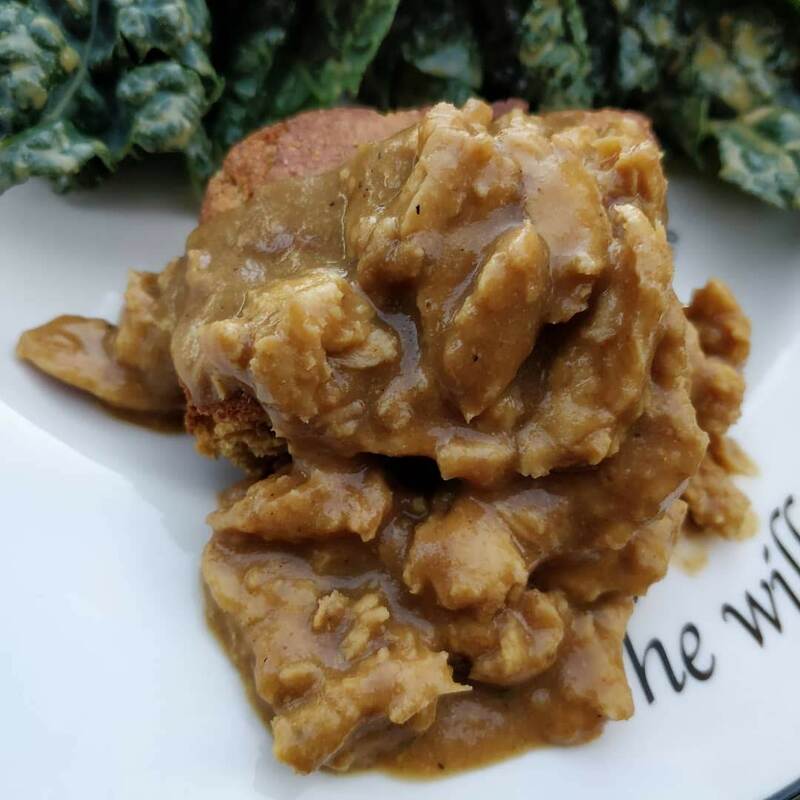 The original gravy recipe is Chuck's from Brand New Vegan. You might message him for advice. Or, you could make any other vegan gravy for this. Any will work! HAPPY HOLIDAYS! I made this tonight for the first time as a test run for Thanksgiving. It is delicious and will definitely be on my Thanksgiving menu for years to come! Thank you for the wonderful recipe! This is awesome news! So thrilled that you enjoyed it! HUGS FROM TEXAS! Learn More About Mrs. Plant! Join Mrs. Plant Community on FB! Find Mrs. Plant on Facebook! 2017 Mrs. Plant. Simple theme. Powered by Blogger.